There’s no need to leave your dog behind on a family vacation. After all, your furry companion is a huge part of your family, right? With about 38,880 pet-friendly hotels in the US, it’s easy to plan a dog-friendly vacation. And with about 13,040 dog-friendly restaurants in the country, your family can dine together, too. Ready to pack? Here’s a list of the top dog-friendly vacation spots in the US for families. Carmel-by-the-Sea, CA. For a top-notch dog-friendly vacation, take a romp to Carmel. Swim at the beach, explore hiking trails and play in parks. Numerous hotels, shops and restaurants welcome dogs with water bowls, dog treats and biodegradable bags. Doggy turn downs, surf lessons and yappy hour are the norm. Spoil your pooch with a massage at the Signature Paw Spa doggy day care. Bring your dog to family-friendly restaurants, such as The Forge in the Forest. Among the over 25 dog-friendly hotels is Carmel Garden Inn. Fees: $25 for one dog and $40 for two dogs per day, which includes a soft dog bed and treats. Los Angeles, CA. Canines of all breeds and sizes get the royal treatment on a dog-friendly vacation in LA. Pamper pooch with a signature Swedish massage at Bliss Paws. Run free at Runyon Canyon Park or hike in Griffith Park. Fred 62 and Messhall Kitchen are among 200 dog-friendly LA restaurants. Bunk down in swanky Beverly Hills. The Kimpton Hotel Palomar welcomes pets of any size for no additional fee. Boston, MA. Besides many dog parks, you can bring Fido to the Apple Store, Polka Dot Bakery and other shops. Bypass traffic and get around on City Water Taxis. No charge for dogs, but advance notice is required. No dog-friendly vacation is complete without family meal times. The Living Room serves American pub food on the waterfront. Find comfy overnight doggy digs at the family-friendly Boston Harbor Hotel. Two pets up to 80 pounds are welcome for a fee of $100 per pet, per stay. Pet amenities include a pet bed, bowls, and treats. Chicago, IL. 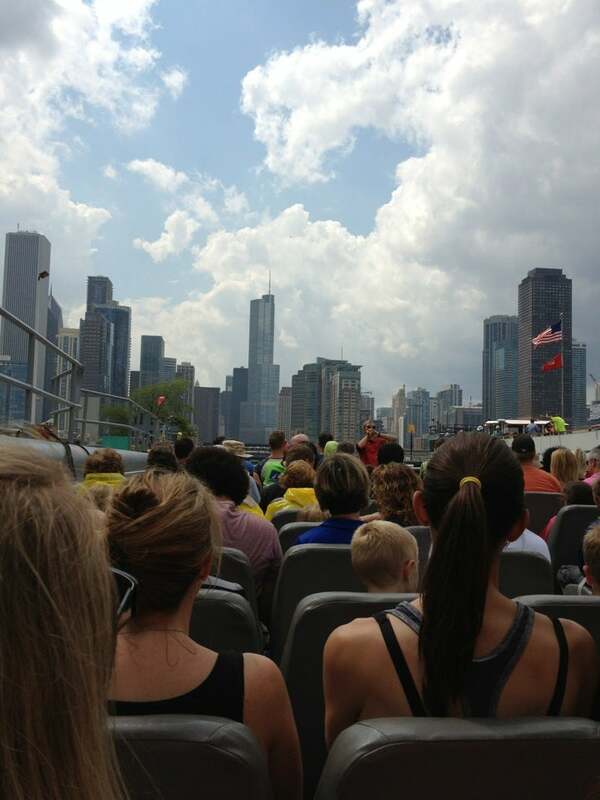 The Windy City provides a dog-friendly vacation on foot and by boat. Energetic dogs love the agility course at Jackson Bark dog park. Take in sights aboard a Seadog Cruises speedboat. Choose from a fast-paced 30-minute cruise, or leisurely 75-minute one. After all that fresh air, feed your hungry human and furry kids at O'Brien's Riverwalk Café in Old Town. Sleep well knowing you can bring two dogs of any size for no additional fee at the kid-friendly Hotel Palomar Chicago. Portland, OR. Enjoy a yummy breakfast at family-friendly and dog-friendly Mother’s Bistro & Bar. Bring your leashed dog to the Portland Saturday Market, and play fetch at many pet-friendly parks. Outdoorsy families will love Forest Park Wildwood Trail, which has 30 miles of dog-friendly hiking paths. Sleep well at the family-friendly Hotel Monaco Portland. Three pets of any size are welcome for no additional fee. Seattle, WA. Bring the gang for a 45-minute, family-friendly Fremont Sunday Ice Cream Cruise around the harbor. Dogs are welcome aboard but must be leashed. Fetch shopping deals at the University Village Shopping Center on this dog-friendly vacation. Enjoy a family-style Italian meal at Ristorante Picolinos. The kid-friendly Westin Hotel Seattle allows two pets up to 80 pounds. No additional fee, but there’s a refundable deposit.